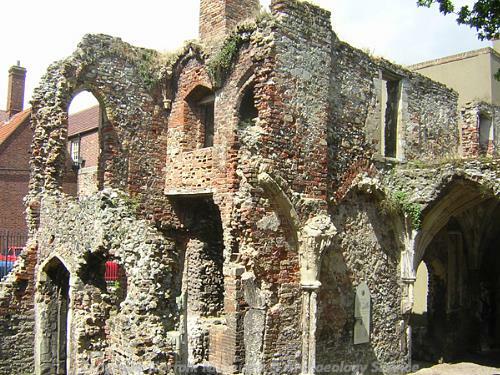 Take a walk around the historic South Quay and discover a 19th century fishing curing works, Great Yarmouth's late 13th century town defences and the site of the Greyfriars Franciscan friary. Park in the small car park opposite the Time and Tide Museum. The walk is approximately 2 kilometres on flat pavements. The walk highlights buildings and sites of historical interest but take time to explore the Quay more thoroughly on the Norfolk Heritage Explorer database as almost every building has a historical record. 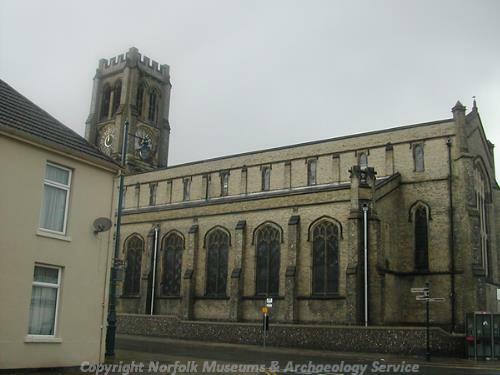 You might like to investigate the Great Yarmouth Archaeological Map online (www.gyam.org.uk). A fish curing works, built in 1880 around a courtyard with a long range of smoke houses, as well as offices and the manager's house. 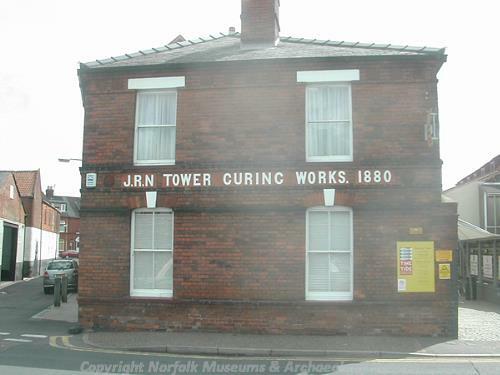 The works was one of the largest commercial curing works in Great Yarmouth, and survives in almost complete condition, little changed since the early 20th century. 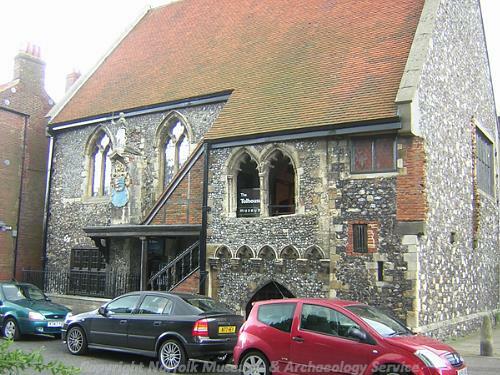 The buildings have now been converted into the Time and Tide Museum, and are open to the public. The town walls and ditch date from the late 13th and 14th centuries. Large sections of the wall and eleven of the original sixteen towers are still standing. The ten gates were demolished in the late 18th and 19th centuries. The East Mount was constructed in 1588, the year of the Spanish Armada, and a moat was constructed in the 17th century, during the Civil War. A 17th century house, dated 1644, which was remodelled in the late 18th century. Some of the rooms have 17th century wood panelling. A contemporary drain or well was found to the rear of the house in 2001. 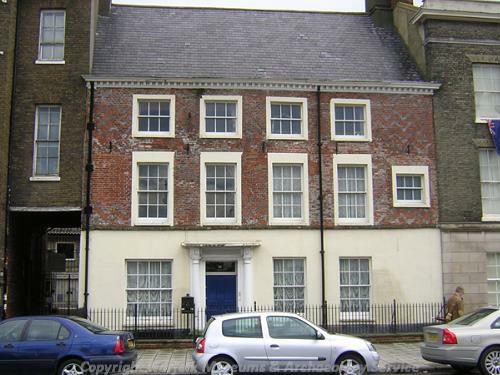 This was the home of Benjamin England, who was Mayor of Great Yarmouth in the late 17th and early 18th centuries. Built in 1909 by Olly and Haward, with a 3 storey gabled façade. On the ground floor are offices with glass and timber partitions, and a cash office. A Jacobean style style staircase leads to the first floor boardroom, which has Jacobean style wood panelling and a decorative plaster ceiling. 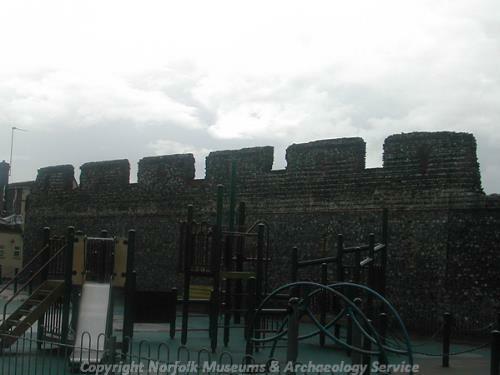 The south wall of the offices is of 16th century brick, which was originally part of the Town House, NHER 4299. An 18th century house, built in 1720 for John Andrews, the largest herring merchant in Europe. The house became a Customs House in 1802. The house contains an 18th century staircase, and wood panelling in some of the rooms. No. 4 South Quay is an Elizabethan house. One of the internal rooms retains panelling dating back to 1596. The drawing room has 16th or 17th century panelling, a royal Stuart coat of arms above the fireplace and a plaster ceiling. There are 17th century cartouches on the staircase. Bits of the kitchen may be medieval, although may have been reset more recently. No. 3 was originally a courtyard range belonging to No. 4. It also contains 17th century panelling and an 18th century staircase. The two houses were formed into one unit when a Georgian white brick facade was built across both in 1809. A detailed survey of the houses carried out for the National Trust suggested that the structure incorporates an earlier medieval 'Row' (street). The houses are owned by the National Trust and open to the public as The Elizabethan House Museum. 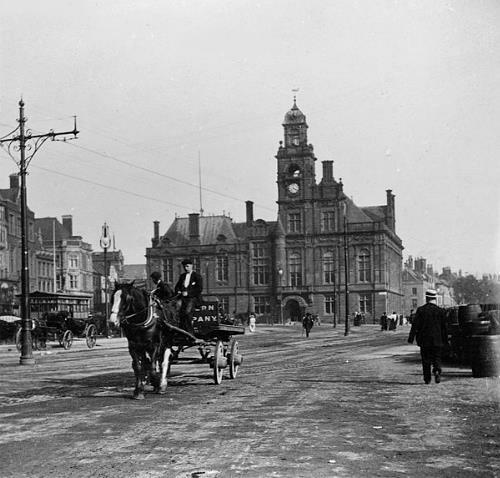 Great Yarmouth Town Hall in the 19th century. Courtesy of Norfolk County Council Library and Information Service. 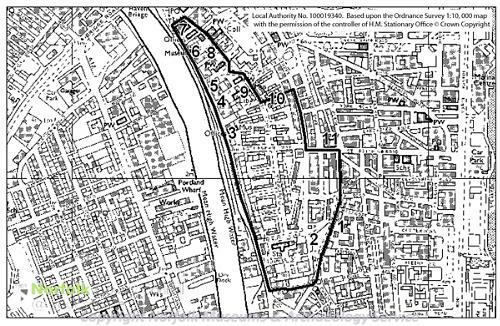 This is the site of Greyfriars Franciscan Friary, which was founded in 1271, and dissolved in 1538. The only upstanding remains of the Friary are a section of the south wall of the church, and the western alley of the cloister. A doorway in the wall of the church leads to a small excavated room containing mid 14th century wall tombs. The cloister has been dated to the 14th century, and is elaborately vaulted, with traces of medieval wall paintings. During the late 16th century the Friary was leased out, and the part of the precinct was used for training the Train Bands, a civilian militia. The site was developed piecemeal from the 17th century, sometimes incorporating parts of the medieval buildings. In 1896 substantial remains of the priory church was found buried underneath Queen Street. 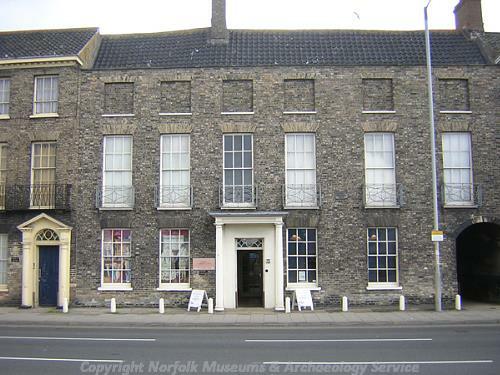 The Tolhouse is one of the oldest buildings in Great Yarmouth, and may date back to the mid 12th century. 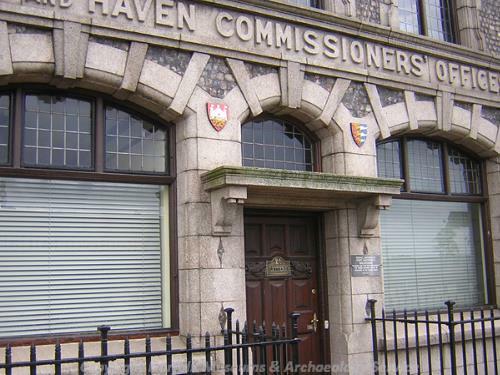 Originally built as a fortified merchant's house with a first floor hall, the building has been used as a prison, a town hall and is now a museum. The building was badly damaged by a bomb in 1941, and was restored in 1960. This is Row 113. The existence of the Rows is suggested in several early 13th century documents, and their existence is confirmed by 1280 (Rutledge, 1990). These early narrow streets are still in existence in many parts of Great Yarmouth. The Rows are fronted with houses along their entire length. Despite heavy bomb damage in the Second World War, and vigorous post-war slum clearance by the Ministry of Works, areas of the Rows survive along the South Quay, beside the Market Place and along King Street. This church was built between 1831 and 1833 by Joseph Scholes and was formerly known as St Peter's. It has been a Greek Orthodox church since 1964. The building is built in Gault brick in generally Perpendicular style. M. Dennis (NLA), 6 July 2007.